What are the common physical and chemical features of alkali metals? (3) They have low density because of the large atomic sizes. The density increases down the group from Li to Cs. The only exceptionto this isK, which has lower density than Na. Since Li+ ion is very small in size, it can easily distort the electron cloud around the negative halide ion. Therefore, lithium halides are covalent in nature. Discuss the general characteristics and gradation in properties of alkaline earth metals. Why are alkali metals not found in nature? Find the oxidation state of sodium in Na2O2. Let the oxidation state of Na be x. The oxidation state of oxygen, in case of peroxides, is –1. Explain why is sodium less reactive than potassium? Compare the alkali metals and alkaline earth metals with respect to (i) ionization enthalpy (ii) basicity of oxides and (iii) solubility of hydroxides. (i) Ionization enthalpy:These have lowest ionization enthalpies in respective periods. This is because of their large atomic sizes. Also, they lose their only valence electron easily as they attain stable noble gas configuration after losing it. (i) Ionization enthalpy:Alkaline earth metals have smaller atomic size and higher effective nuclear charge as compared to alkali metals. This causes their first ionization enthalpies to be higher than that of alkali metals. However, their second ionization enthalpy is less than the corresponding alkali metals. This is because alkali metals, after losing one electron, acquires noble gas configuration, which is very stable. (ii) Basicity of oxides:The oxides of alkali metals are very basic in nature. This happens due to the highly electropositive nature of alkali metals, which makes these oxides highly ionic. Hence, they readily dissociate in water to give hydroxide ions. (ii) Basicity of oxides:The oxides of alkaline earth metals are quite basic but not as basic as those of alkali metals. This is because alkaline earth metals are less electropositive than alkali metals. (iii) Solubility of hydroxides:The hydroxides of alkali metals are more soluble than those of alkaline earth metals. (iii) Solubility of hydroxides:The hydroxides of alkaline earth metals are less soluble than those of alkali metals. This is due to the high lattice energies of alkaline earth metals. Their higher charge densities (as compared to alkali metals) account for higher lattice energies. In what ways lithium shows similarities to magnesium in its chemical behaviour? Explain why alkali and alkaline earth metals cannot be obtained by chemical reduction methods? Why are potassium and cesium, rather than lithium used in photoelectric cells? When an alkali metal dissolves in liquid ammonia the solution can acquire different colours. Explain the reasons for this type of colour change. At a higher concentration (3 M), clusters of metal ions are formed. This causes the solution to attain a copper–bronze colour and a characteristic metallic lustre. Beryllium and magnesium do not give colour to flame whereas other alkaline earth metals do so. Why? Discuss the various reactions that occur in the Solvay process. Potassium carbonate cannot be prepared by Solvay process. Why? Why is Li2CO3 decomposed at a lower temperature whereas Na2CO3 at higher temperature? Compare the solubility and thermal stability of the following compounds of the alkali metals with those of the alkaline earth metals. (a) Nitrates (b) Carbonates (c) Sulphates. Starting with sodium chloride how would you proceed to prepare (i) sodium metal (ii) sodium hydroxide (iii) sodium peroxide (iv) sodium carbonate? (a) Sodium can be extracted from sodium chloride by Downs process. This process involves the electrolysis of fused NaCl (40%) and CaCl2 (60 %) at a temperature of 1123 K in Downs cell. (ii) Sodium hydroxide can be prepared by the electrolysis of sodium chloride. This is called Castner–Kellner process. 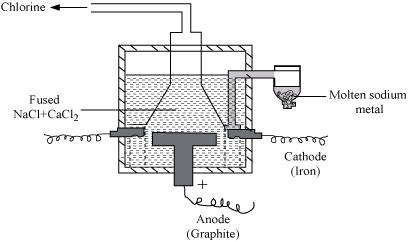 In this process, the brine solution is electrolysed using a carbon anode and a mercury cathode. What happens when (i) magnesium is burnt in air (ii) quick lime is heated with silica (iii) chlorine reacts with slaked lime (iv) calcium nitrate is heated ? Describe two important uses of each of the following: (i) caustic soda (ii) sodium carbonate (iii) quicklime. Draw the structure of (i) BeCl2 (vapour) (ii) BeCl2 (solid). The hydroxides and carbonates of sodium and potassium are easily soluble in water while the corresponding salts of magnesium and calcium are sparingly soluble in water. Explain. Describe the importance of the following: (i) limestone (ii) cement (iii) plaster of paris. Why are lithium salts commonly hydrated and those of the other alkali metal ions usually anhydrous? Why is LiF almost insoluble in water whereas LiCl soluble not only in water but also in acetone? Explain the significance of sodium, potassium, magnesium and calcium in biological fluids. (a) Sodium ions help in the transmission of nerve signals. (b) Unlike the other elements of group 1, Li reacts directly with nitrogen to form lithium nitride. This is because Li+ is very small in size and so its size is the most compatible with the N3– ion. Hence, the lattice energy released is very high. This energy also overcomes the high amount of energy required for the formation of the N3– ion. How would you explain the following observations? (i) BeO is almost insoluble in water and BeSO4 is soluble in water. Be2+ is a small cation with a high polarising power and O2– is a small anion. The size compatibility of Be2+ and O2– is high. Therefore, the lattice energy released during their formation is also very high. When BeO is dissolved in water, the hydration energy of its ions is not sufficient to overcome the high lattice energy. Therefore, BeO is insoluble in water. On the other hand, ion is a large anion. Hence, Be2+ can easily polarise ions, making BeSO4 unstable. Thus, the lattice energy of BeSO4 is not very high and so it is soluble in water. (ii) BaO is soluble in water, but BaSO4 is not. Ba2+ is a large cation and O2– is a small anion. The size compatibility of Ba2+ and O2– is not high. As a result, BaO is unstable. The lattice energy released during its formation is also not very large. It can easily be overcome by the hydration energy of the ions. Therefore, BaO is soluble in water. In BaSO4, Ba2+ and are both large-sized. The lattice energy released is high. Hence, it is not soluble in water. Which of the alkali metal is having least melting point? Which one of the following alkali metals gives hydrated salts? Smaller the size of an ion, the more highly is it hydrated. Among the given alkali metals, Li is the smallest in size. Also, it has the highest charge density and highest polarising power. Hence, it attracts water molecules more strongly than the other alkali metals. As a result, it forms hydrated salts such as LiCl.2 H2O. The other alkali metals are larger than Li and have weaker charge densities. Hence, they usually do not form hydrated salts. Which one of the alkaline earth metal carbonates is thermally the most stable?